HS 665 - 3wheel scooter - Introducing the new HS-665 3 Wheel Scooter - the new standard in stylish design and top performance in a 3 wheel scooter at an affordable price! 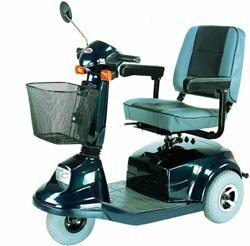 This 3 wheeler is loaded with the same features as top end scooters such as: Full light kit with front light, tail light and directional signals, swivel, sliding seat, infinitely adjustable tiller, rear view mirror, rear bumper, front basket, contoured padded seat and much more! This scooter will maneuver well indoors, as well as outdoors over grass and gravel. Mid-Sized 3 wheel scooter offering high end features at an affordable price! Wheel Size Front and Rear - 11"
Top speed of 5 mph. Comfortable Med. back Contoured padded seat. 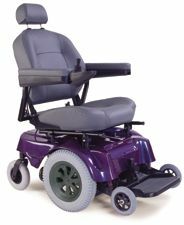 Full Swivel and Sliding Seat. Double automatic safety braking system. Infinitely adjustable tiller for the ultimate comfort. Flip-up, angel and width adjustable arm rests. Weight capacity of 350 lbs.